I couldn't wait to have my own car. I finally got one, all to myself, in 2002 for my junior year of college. I was ecstatic. It was a 1996 Nissan Maxima that was everything I wanted: manual transmission and a fast V6 engine in a midsized 4-door sedan. 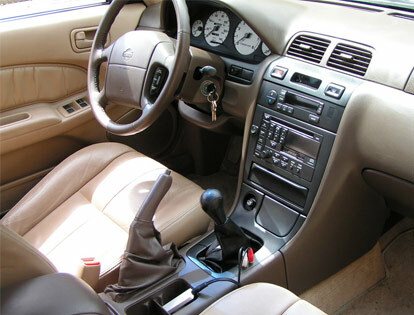 And it was decked out with every optional feature available: heated leather seats, Bose sound system, sunroof, power everything, climate control, fog lights... every option that could have been put on a manual-transmission 1996 Maxima. For two years, I drove the best car of anyone I knew. I've never seen anyone with a "first car" as nice as this. My mother has never had a car this fancy - the Maxima really is a luxury car without much of the luxury price premium. Sure, it required premium fuel and only managed about 18 MPG in the city, but I loved driving it. Then parts started breaking. In the last 10 months, I've put about $2500 into this car just to keep it going. Out of desperation, I went to the Maxima.org forums and they told me that it was normal for a 9-year-old car to put $1000-2000 per year into its maintenance. Apparently, people do this all the time. I started investigating my options. If I'm averaging about $200 per month for repairs, and the value of cars constantly decreases, couldn't that money be better spent toward a new car with better gas mileage? After all, with the recent skyrocketing gas prices, a full tank in my Maxima will take me about 250 city miles or 400 highway miles, but it will cost me almost $60. At that price, traveling long distances by bus, train, or plane is often cheaper than driving myself (and I wouldn't have to drive, which is a big bonus). And gas prices will only continue to increase. Of course, buses need gas, planes need jetfuel, and trains need some sort of energy, so their costs will increase eventually too - but for now, a car that gets mediocre gas mileage is a worse deal. Let's consider some options to see if I can get a better deal with a new (or a different used) car. Buy a new car: Better gas mileage and little or no maintenance costs, but high down payment, high monthly payments, and increased insurance premiums. Can eventually sell at a huge loss. Lease a new car: Better gas mileage, almost zero maintenance, small or no down payment, and relatively low monthly payments, but at the end, you have no resale value to reduce the overall effective cost. Buy a young used car: Moderate gas mileage, moderate maintenance, still expensive for a reliable model (since the reliable models hold their value well), and at the end, you can sell it for a big loss. Only worthwhile if you expect to own it after you stop making payments, but as time passes, maintenance costs increase. If it's not maintenance, it's depreciation or payments. You are losing money every month, no matter what. There's no good way to get a different $15,000 metal box every 5-10 years without paying out the nose for it in some form. Then there's gas and insurance. After evaluating all of the options, I've decided to go car-less for a while. I walk the 5 blocks to work every day anyway, and I pass most common errands on the way. I've lived in my apartment for a year and already have the big items I need. Since I'm out of college and own furniture, I have to rent a truck if I want to move to a new place anyway. I can't just stuff everything I own into a car and drive away. Most importantly, not having a car will save me almost $500 per month in gas, insurance, and average maintenance. $500 per month, plus whatever I can sell the car for. That's a lot of money, and if I ever need to take a taxi, ride the bus, or rent a vehicle, it'll easily fit within that budget and leave me plenty to spare. I'm in one of the (probably) few times in my life when I don't really need a car, so I'm going to take advantage of it. Consider it for yourself: is your car really worth $500 or more per month? I love my Maxima, but the occasional trip to a big retail store or a lazy trip to the grocery store just aren't worth that much money. For all I know, this could end up sucking more than I forsee, and I might break down and buy a car in January. Maybe I'll hold out until June or longer. Whatever the duration, I'll save a bundle of money during this time.